Once when I picked her up at Meadowood in St Helena where she often stayed, I had to do a little domestic business before we took off for a small lunch with some important people she had to meet with. 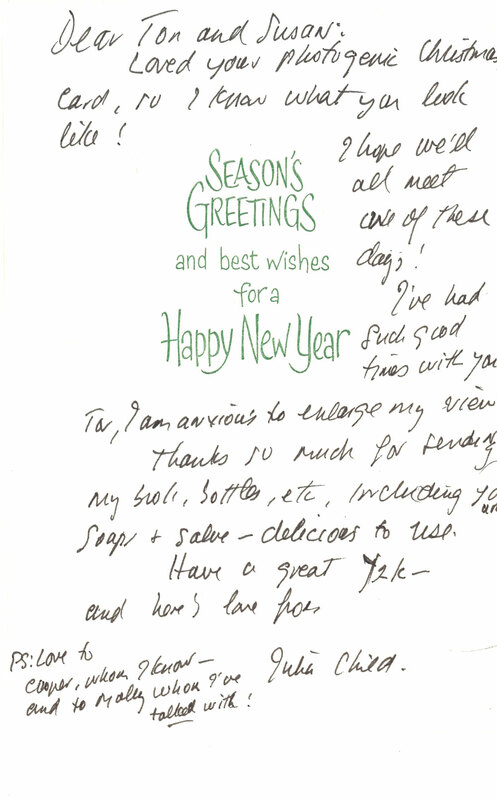 My wife, Susan, was back East on business, and I was managing our 11 year old son’s days during the summer break. Cooper had slept in and upon waking need the info on what I had cooked for him. There was a long pause at both ends. “Yes,” he replied. He was earnest, interested. He was ready when we got there, and carried on a very good conversation with Julia on the drive. I think I talked little. He sat next to Julia during the multi-course lunch (I don’t remember anything but multi-course when dinning with her – everyone wanted to show off), and I think Julia talked more to him then she did any of our other lunch guests. She was sincerely interested in what he was interested in, what food he liked, what he wanted to do. It was an enchanting lunch he never forgot, nor did I. Several years later, Susan and I were in the Sierras on an escape vacation, away from TV and the world. One morning Cooper called me. His voice and demeanor when I answered were very serious, which immediately concerned both of us. “Dad, I don’t know if you heard yet. Julia passed away,” he said. We talked about her briefly, and I reminded him of how many people she had touched in her lifetime, but I really didn’t need to. He had known, and was inspired by her curiosity and interest in his life. He was like so many others whose lives were changed in small to large ways by her interest in them. Occasionally when I talk to groups, I mention mentors I’ve had in the past and present. 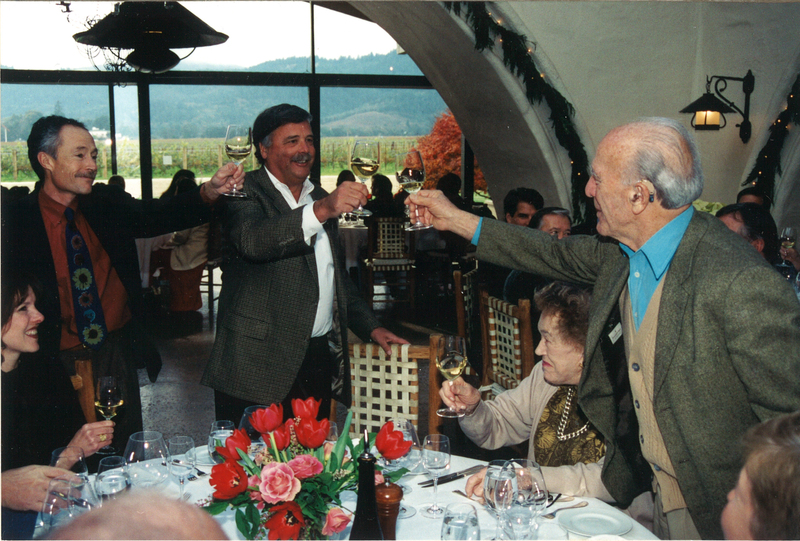 Winemakers like Andre Tchelistcheff, my good friend Myron Nightingale, Bob Mondavi, and so many others in the early days. Now I listen to my winemaker Jeff Ames and his peers, Andy Erickson, Thomas Brown, and so many others. We ask questions. We get answers. We share information. People often seemed surprised that after three decades of making wine myself and being such an avid student, I still relish learning more. There is still so much to learn. Winemaking is also winegrowing and if you combine them I will easily go to the grave someplace not far up on the learning curve. They seem surprised, and then I tell them that I often run into people who ‘know everything about wine.’ This always gets a quiet room. Julia, thank you for inspiring me to continue learning, growing, and staying challenged. Cheers.